In a dream, Kishana Lewis remembers her memories of the fire in the woods with the Martian Manhunter. She is disturbed...the men she worked with had lives, families. She wants to save them, but can't. She sees a White Buffalo, the sacred symbol of the plains Indians. White Buffalo Woman appears, and Thunderbird lands on her shoulder. The ground beneath them disappears, and as they fall, Manhunter tells her that she must be descended from Abel Carmody. Green Lantern tells the team that he can't find any sign of the evil stirring anywhere in the valley. The caretaker opens the door to the monsters within the resort, and Wonder Woman radios in to tell the League that she's going hunting. She's armed with weaponry from the basement. Batman laments that he sees no potential victory in their future. Superman is listening to what is going on. False alarm. Manhunter returns and briefs Batman on the relation of Kishana and Carmody. Superman interrupts them. The mansion has been breached. Wonder Woman leaps over Mr. Hume, the caretaker, and attacks the beasts in the hall. She tells him to take cover. Wonder Woman fights viciously, but she faces overwhelming odds. Jade arrives to help, but it is too late. Wonder Woman has been subsumed. Superman and Manhunter, over the valley, use both of their heat visions together to superheat the ground and cause the most massive volcanic eruption the world has ever seen. Lantern struggles to control it while monsters dissipate. Flash takes Plastic Man to Batman at Batman's behest. He has a plan. He puts Plastic Man OVER Kishana so the creatures won't sense her, then they move out to confront the creatures using Kishana's gift, passed down from Carmody. 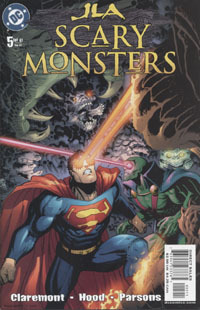 The monsters attack Superman and Manhunter. On the way out, Wonder Woman stops Batman's troupe dead in their tracks. Story - 4: This is only a light step down from the last issue, because there were several issues of plausibility that clung at me. First, if they cause the largest eruption ever, wouldn't that effect things far from their point in time as well as where Lantern can control? It's not a big deal. Also, I didn't buy the whole "they won't see Kishana because she's under Plasty" thing." They're magical. If they were machines, or sentient.well, anyway, it kind of rubbed me wrong. Still, the story is in great shape, heading for climax, and we have some really great team stuff, which is what I'm most pleased with in terms of Claremont's writing here on this series. He'd make a GREAT JLA writer, I'm still convinced. All we need now is a bang-up ending, and I'd say we have a fair nominee in the running for best series of 2003 with the Shield Awards, right up there with Birthright and Metropolis. Art - 4: A little dip from the last issue, as with the story, but still top-notch stuff. The scenes with Manhunter and Kishana are very tender, very well done. The thing that really tore me was the Volcano thing. I mean, the splash page is great, but I wanted to see great gouts of lava, and I was expecting it. I imagine format didn't allow for extrapolation, but it would have been cool. That said, I'm still having more fun with this art than ANY of the regular Superman artists of late. Cover Art - 3: Average. The rest of the covers have been so dynamic, so out there, this one kind of fell out of the pace a little bit. It depicts something that doesn't happen within the issue, per ce, and I can't really tell what Superman OR Manhunter are going after. But it's not contrived, it's not overly trying to sell the book with falsehoods, so it's not horrible. Just average.